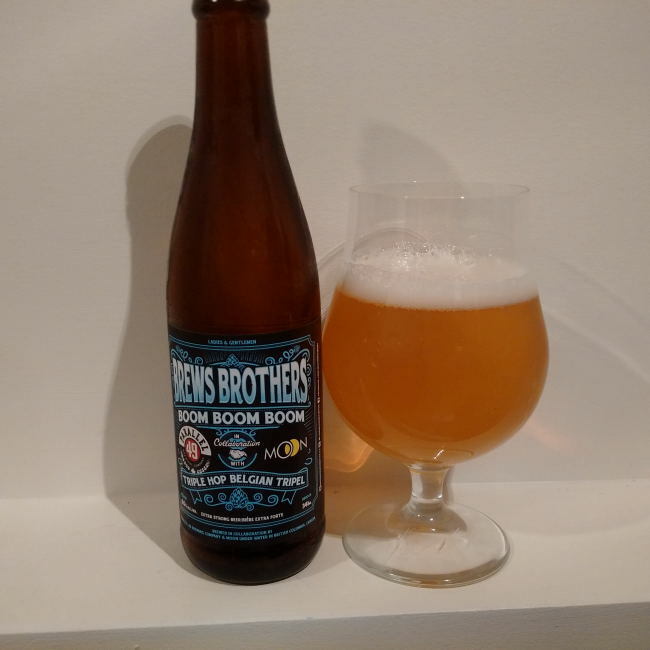 From Parallel 49 Brewing’s Brews Brothers Collaboration mixer pack comes the “Boom Boom Boom” Triple Hop Belgian Tripel. This beer has been produced in Collaboration with The Moon Under Water Pub & Brewery out of Victoria. The beer pours a cloudy golden colour with a white head. The aroma consists of yeast, maybe tropical fruits, sweetness, sugar and some floral hops. The flavour is of Belgian yeast, banana, pineapple, sugar, sweetness, resin and a mild to medium hops bitterness. The alcohol content comes in at 9%. This beer was not a standout in the Brews Brothers box but it was still enjoyable. This entry was posted in Belgian Tripel and tagged banana, bc, belgian tripel, belgian yeast, bitter, bitterness, boom boom boom, canada, east van, east vancouver, hopped, hops, hopy, medium bitter, mild bitter, Moon Under Water Pub & Brewery, moon under water pub and brewery, parallel 49 brewing, pineapple, resin, sugar, sweet, sweetness, triple hop belgian tripel, vancouver, victoria.